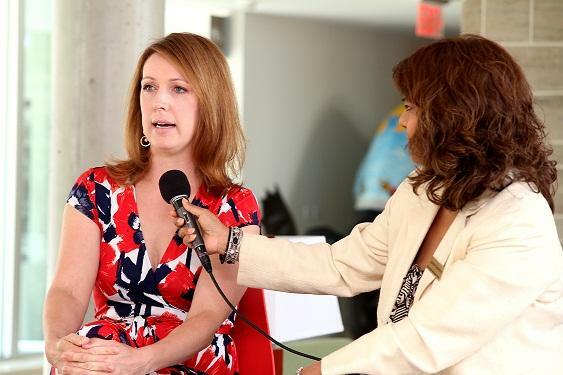 Holly Horton is a highly recognizable face in the Canadian broadcasting industry. She has worked on-air with several major networks and is a natural in front of the camera. Holly is a graduate of the Radio and Television Arts program at Ryerson University in Toronto, and also earned an honours degree in Psychology from the University of Western Ontario. She began her broadcasting career in 1998 as an editor and writer with Global Television in Toronto, where she stayed until 2000. Holly worked with Global until 2004, when she joined TSN as a sports reporter. Some of Holly’s career highlights include coverage of the Canadian women’s hockey team in international competition and reporting on Team Canada’s gold medal victory in men’s hockey at the 2002 Olympic Winter Games. She was also awarded the play-by-play role for the freestyle skiing events at the 2010 Winter Olympics in Vancouver, but declined in order to care for her newborn son. After choosing to leave TSN, Holly has worked for the CBC as a general sports reporter and brings her skills, knowledge, and professionalism to our national broadcaster.